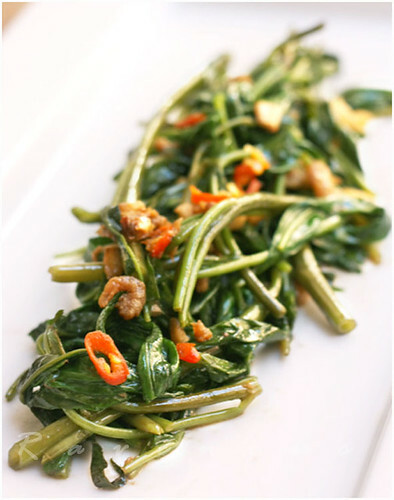 We love the semi aqautic vegetable rau muong, otherwise known as water spinach, morning glory, ong choy (Chinese), or kang kung/kong (Indonesian/Malasian). In some US states, this is considered a “noxious weed” –not so much that it’s toxic or noxious to eat, but it can grow rapidly without much care and can be deleterious to native plants. It actually has similar nutritional benefits of spinach. 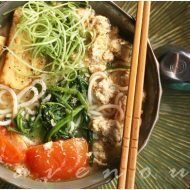 In Vietnam however, this is the staple vegetable for the poor and common folk and is used in a variety of ways–most commonly stir fried with garlic and eaten as a vegetable side or stems julienned and served with noodle soups. 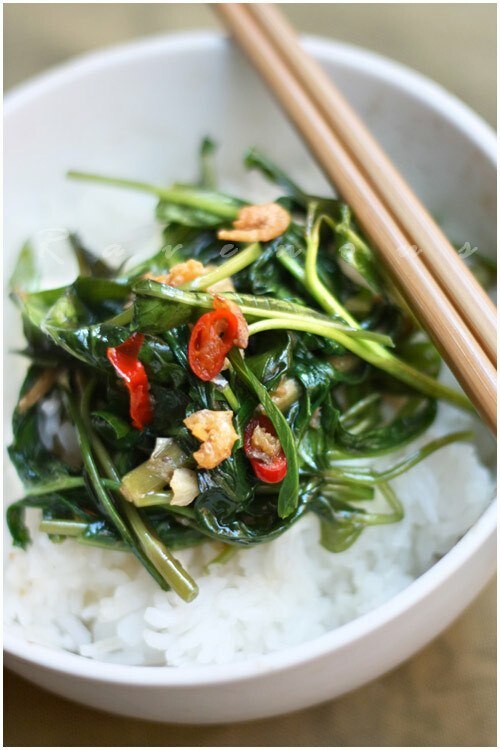 While we love the classic Vietnamese stir fry with garlic, we can’t get enough of the Malaysian preparation called kangkung belacan which incorporates Malaysian style fermented shrimp paste belacan as the key ingredient. Rasa Malaysia has an excellent belacan yam leaves recipe which we adapted. This is an extremely tasty dish but close all your bedroom doors, open all your windows, and turn the vent on high and don’t wear your favorite shirt as the smell is pungent!! 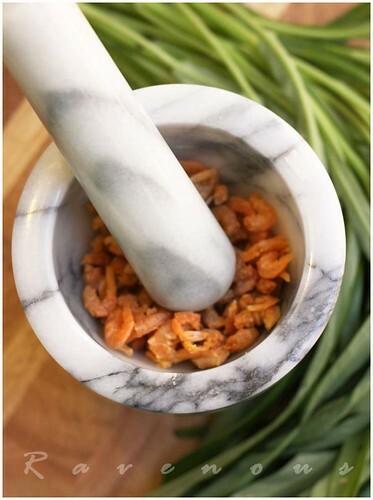 With mortar and pestle mix shrimp and dried belacan paste together, breaking up the soften shrimp but not totally obliterating it. Heat a large wok or pan on high, add cooking oil and when oil is hot (smokes), add garlic, shallots, belacan paste mixture. Stir for a minute or so and you will really smell the belacan becoming more fragant–add the rau muong and quickly stir fry until just wilted. Toss in the chili and add a tbs or two of the shrimp water if desired for a bit of moisture to the sauce. Do not over cook and immediately take of heat and transfer to serving platter. 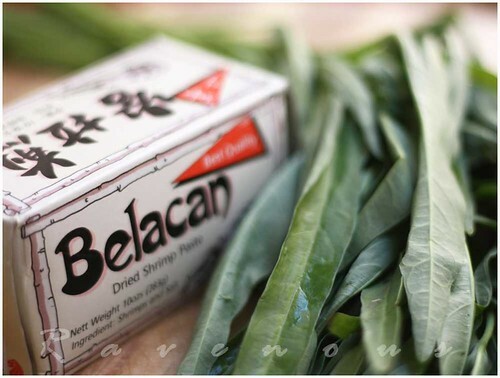 Serve with jasmine rice and share with your neighbors the wondeful aroma of belacan! Hmmm, this is one of my favorite Thai dishes! My MIL made similar dish but with lots of chili. SO yummy! To Dorrie: It's more like a Malaysia-Singapore dish because of the belacan. Nice photo! adel: We always order kangkung belacan whenever we're at malaysian/indonesian restaurants. Dorrie: Almost every southeast asian country has it's own version of kangkung belacan, including thai. Anh: I'm sure her's is amazing. perhaps she used sambal belacan? Mmm! Pass the stinky greens, please! Water spinach is a new ingredient to me. Thanks for sharing! I wonder if I can find it in my local Asian store..
Sala: most Asian groceries will have water spinach but may not label it as such. Look for it's other Asian names. Thanks for the little introduction about this dish! I really did not know this particular prepartion actually orginiated from Malaysia! This is mine and my parents' favorite dish to make on a weekday meal. We normally fight for the last bite!!! Your photos are gorgeous….! Thanks for the web site!!! adelina: Despite it's pungent aroma, Kangkung belacan is amazingly addictive! Bee: The belacan definitely looked and smelled authentic. We got it at Saigon City Supermarket on Brookhurst in Little Saigon. yum! ong choy with spice! i like it! Hey couple, thanks for all the great recipes! U guys are awesome. I wanted to ask about the belecan paste, do they only sell this at Malaysian market or can I find it at a viet market? hard to find belacan in the block form, we’ve only seen it in a few places, maybe try online?